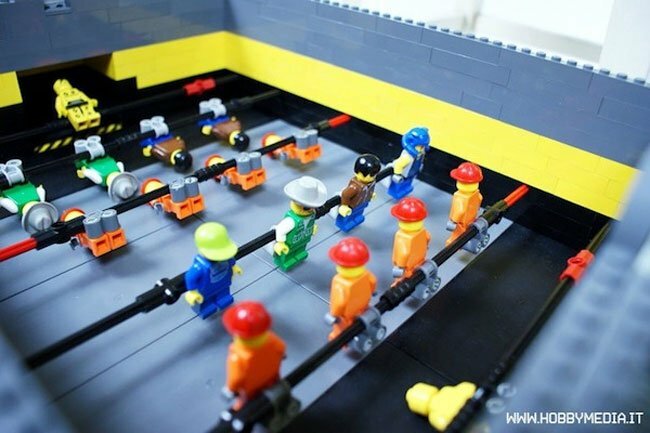 Sariel a Lego building master has created a fully working table football table game entirely from Lego. Its even fitted with sensors at the goals to automatically to record the score and issue an audio announcement when a goal is scored. Check out the video of the table in action after the jump. The game score is displayed above the goals using sliding Lego blocks and stickers and there is even a built in ball return mechanism designed to return the balls to speed up play. Counting the game score and returning balls to a box are both fully automated. The actual game remains, obviously, fully manual, with eight players on two axles for each team, and a single goalkeeper on a separate axle. The goalkeeper’s sideways movement is limited so that the gate is not accidentally left empty. The players’ axles use different colors for improved distinction. The game is played on a pitch paved with large tiles and surrounded with solid walls build of classic bricks. Both gates have WeDo motion sensors inside, arranged in such a way that incoming ball must pass in front of the sensor. The ball then falls into a simple system of hanging rails, with one rail for each gate and a single central rail that receives all balls and directs them to a box.